Monument Lab is a national public art and history project based in Philadelphia. Our goal is to critically engage the monuments we have inherited and unearth the next generation of monuments through stories of social justice and solidarity. We work with artists, activists, municipal agencies, and civic stakeholders on creative approaches to public art, history, and memory. Through art exhibitions, participatory projects, a national fellows program, and a new website and podcast, Monument Lab is building research and creating conversations around the past, present, and future of monuments. Founded in 2012, Monument Lab emerged from a series of classroom conversations. 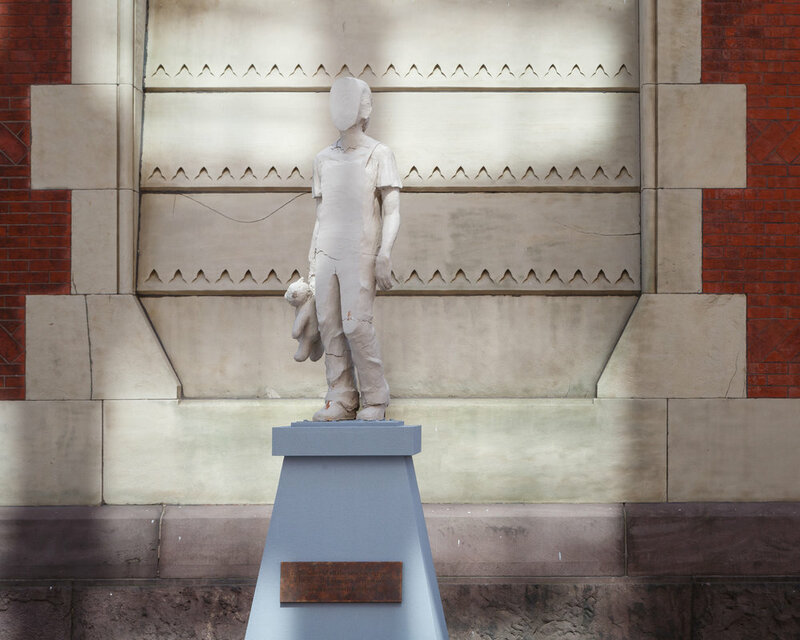 In 2015, it grew to include the installation of a pair of outdoor classrooms in the courtyard of Philadelphia’s City Hall through a discovery phase – one, a sculpture envisioned by the late artist Terry Adkins and the other, an adjacent learning lab operated by students who gathered hundreds of public monument proposals. 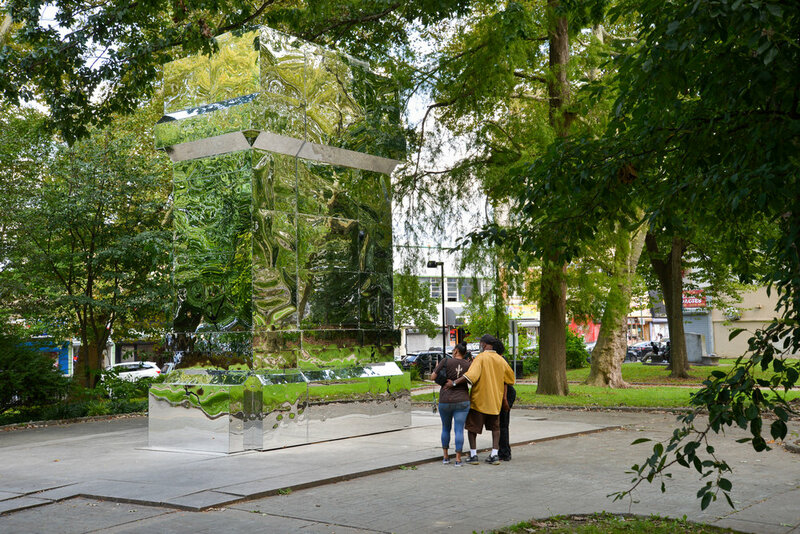 In the continued spirit of collaborative learning, Monument Lab collaborated with Mural Arts Philadelphia on a citywide exhibition in 2017 featuring temporary prototype monuments by 20 artists across 10 sites in Philadelphia’s iconic public squares and neighborhood parks, presented together with research labs, where nearly 4,500 creative monument proposals were collected from Philadelphians and visitors. The proposals offer a dataset of public speculation available on OpenDataPhilly and shared in a Report to the City. The forthcoming book, edited by co-founders Paul M. Farber and Ken Lum, is titled Monument Lab:Creative Speculations for Philadelphia (Temple University Press, 2019). Monument Lab is committed to building on the conversation about monuments and engaging collaborators across the country. We are working on new tools and partnerships in cities such as New Orleans, Newark, Chicago, and Memphis. Artists: Terry Adkins, Tania Bruguera, Mel Chin, Kara Crombie, Tyree Guyton, Hans Haacke, David Hartt, Sharon Hayes, King Britt and Joshua Mays, KLIP Collective, Duane Linklater, Emeka Ogboh featuring Ursula Rucker, Karyn Olivier, Michelle Angela Ortiz, Kaitlin Pomerantz, RAIR – Recycled Artist in Residency, Alexander Rosenberg, Jamel Shabazz, Hank Willis Thomas, Shira Walinsky and Southeast by Southeast, and Marisa Williamson. Lead Monument Lab Partners: City of Philadelphia; Philadelphia Parks & Recreation; Office of Arts, Culture, and the Creative Economy; Historic Philadelphia; Independence National Historic Park; Penn Institute for Urban Research; Pennsylvania Academy of the Fine Arts; Price Lab for Digital Humanities; and the University of Pennsylvania. Major support for 2017 Monument Lab projects staged in Philadelphia's five squares has been provided by The Pew Center for Arts & Heritage. An expanded artist roster and projects at five neighborhood sites have been made possible by a significant grant from the William Penn Foundation. Additional support has been provided by Hummingbird Foundation, National Endowment for the Arts, Tuttleman Family Foundation, and more. Support for Monument Lab's final publication provided by the Elizabeth Firestone Graham Foundation. Link to Download Public Monument Proposals on OpenDataPhilly. The Wall in Our Heads: American Artists and the Berlin Wall commemorates the twenty-fifth anniversary of the dismantling of the Berlin Wall and reflects on legacies of division in American culture. The exhibition features critical American artistic perspectives of the Berlin Wall from 1961 through the present, including artworks that confront social boundaries in the United States as well as the complex historical crossroads of Berlin. Artists: Lindy Annis, Alexandra Avakian, Jonathan Borofsky, Chuck D, Frank Hallam Day, Electronic Disturbance Theater 2.0/b.a.n.g. lab, Ron English, Allen Frame, Leonard Freed, Nan Goldin, Keith Haring, Oliver Harrington, Carol Highsmith, James Huckenpahler, Allan Kaprow, Farrah Karapetian, Nilay Lawson, Oliver Miller, Adrian Piper, Stephanie Syjuco, Shinkichi Tajiri, Bill Van Parys and Reyes Melendez, and Lawrence Weiner. Guest Speakers: Michael Kimmelman, Axel Klausmeier, Hope Harrison, Penny Von Eschen, Amber Art Collective, Jessica Solomon, Mark Strandquist, and Shira Walinksy. Partners: The exhibition was commissioned and first shown at the Goethe-Institut Washington from October 15-December 15, 2014. 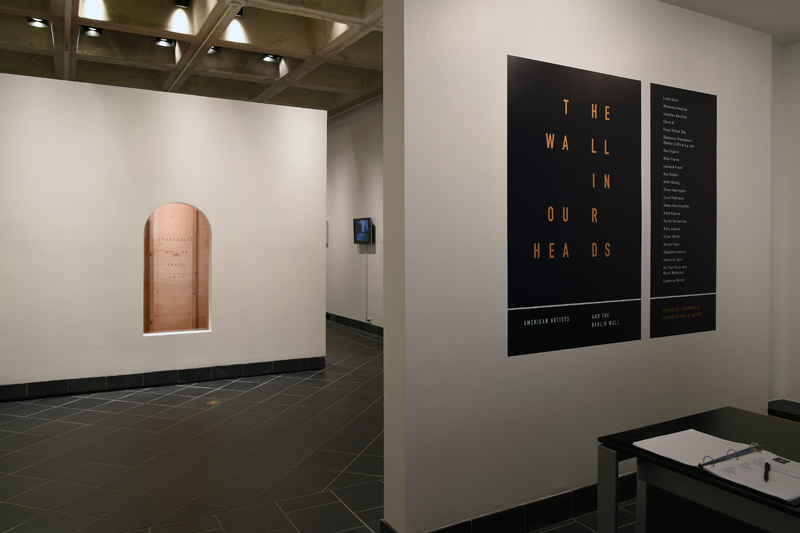 The Wall in Our Heads later traveled to Haverford College's Cantor Fitzgerald Gallery from October 13-December 13, 2015. Haverford's exhibition and its related programming at Haverford College were made possible with the support of Haverford’s new Initiative in Ethical Engagement and Leadership and the John B. Hurford ’60 Center for the Arts and Humanities. The Wall in Our Heads also received generous support from the following institutions: Adrian Piper Research Archive Foundation, Getty Research Institute, Keith Haring Foundation, Library of Congress, Magnum Photos, National Gallery of Art, Provisions Library, and The Wende Museum. Link to Keynote Conversation with New York Times Architecture Critic Michael Kimmelman. Link to Student Publication Keywords on Division. 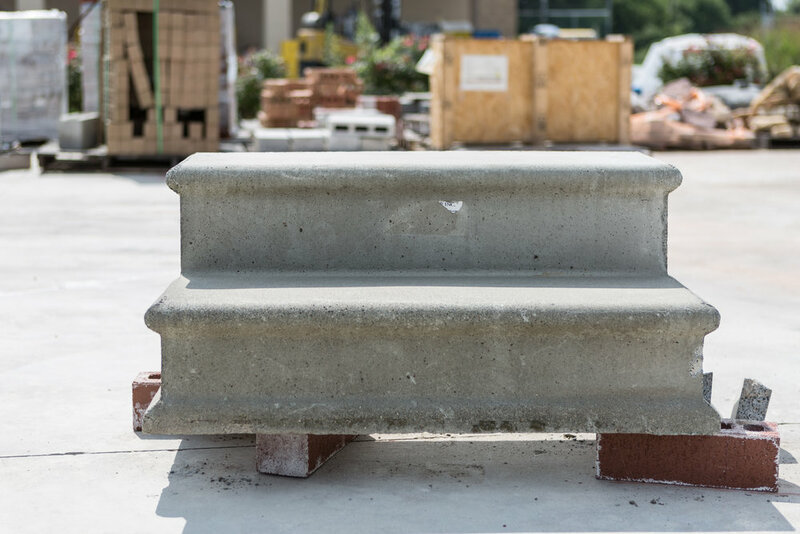 American Rubble addressed the physical and social transformation occurring in our cities. Encompassing an artist residency, exhibition, and day-long symposium featuring U-C Berkeley Art Professor Stephanie Syjuco, the project engaged issues from the dismantling of the Berlin Wall in 1989 to contemporary urban redevelopment projects in Philadelphia's post-industrial neighborhoods. Invited artists, scholars, and students considered both how cultural producers document urban change and economic upheaval, and how they might imagine possibilities for collectivity through urgent forms of public memory. Such a framework aimed to measure changes due to historic "events" but also the less tangible undercurrents of gentrification. Throughout the project, we explored how artistic projects and cultural interventions at sites of memory—including those that draw on rubble, ruins, traces, echoes, memes, and remixes—critically empower a history of the present. Artists/Scholars: Stephanie Syjuco, Joshua Clover, Susanne Slavick, Salamishah Tillet, and Camilo José Vergara. Partners: Support for American Rubble was provided by the John B. Hurford '60 Center for the Arts and Humanities and the Mellon Creative Residencies Program. Link to American Rubble Documentary. The In/Out Symposium is a three-part, annual series focused on contemporary issues in socially-engaged art. Presented by Mural Arts Philadelphia and Moore’s Graduate Social & Studio Practices department, this two day-long symposium focused on selected case studies from local, national and international contexts that that highlight this field from multiple perspectives. The three respective themes include: Time, Pacing, and Perspective (2015); Ethics, Attention and Intention (2016); and Scale, Inclusion, and Equity (2017). Artists/Scholars/Sites (2015): Rick Lowe, Walidah Imarisha, Chicago Torture Justice Memorials, Immigrant Movement International, Corona (Queens, New York City), Neighborhood Time Exchange, the Village of Arts and Humanities, Asian Arts Initiative, Helen Haynes, Denise Brown, Aaron Levy, Shira Walinsky, and Selina Morales. Artists/Scholars/Sites (2017): Roberto Bedoya, Not an Alternative’s The Natural History Museum, Jane Golden and Patti Phillips, Russell Craig, Jesse Krimes, Dawan Williams, Parris Stancell, Al Tull, Taller Puertorriqueño, Philadelphia History Truck, Mural Arts Philadelphia projects from the Porch Light, Restorative Justice programs, and the "Long Haul" – Students in dialogue with Community Arts Organizations in operation for more than 25 Years across Philadelphia: Taller Puertorriqueño, Asian Arts Initiative, Village of Arts & Humanities, Painted Bride, and Fleisher Art Memorial.